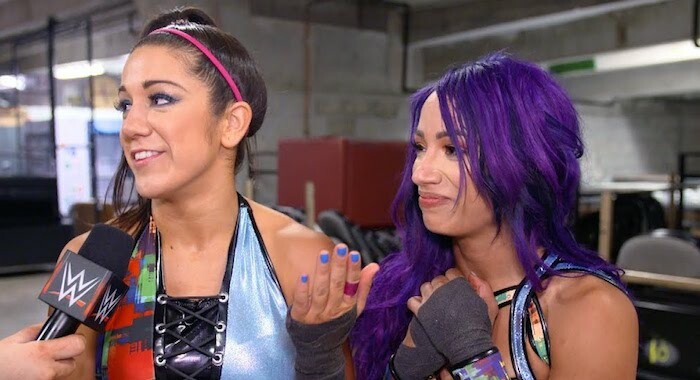 In an exclusive interview for WWE’s YouTube channel, Bayley spoke about Sasha Banks’ injury, stating she is confident her partner will be fine for Sunday. Banks was attacked by the Riott Squad during the match, with The Boss being taken to the back, marking a second week in a row where she hasn’t wrestled. In reality, Sasha Banks is reportedly dealing with an undisclosed injury which is why WWE has kept her out of in-ring competition and decided to turn the situation into a storyline. It is unknown at this point whether she will be fit for Sunday, but this is a way that WWE could write her out if needed. Because Bayley was pinned on Raw last night, Bayley and Banks will start the Elimination Chamber as one of the first two teams, giving them a distinct disadvantage ahead of the match.